Throw It Down, an 88-minute documentary from director John E. Maher, offers a rare behind-the-scenes look at the reality of marching in a top-ranked drum and bugle corps. The film follows the 2006 season of the Bluecoats Drum & Bugle Corps from Canton, Ohio, and presents themes that are universal to anyone involved in the marching activity. This is a film about perseverence and the ultimate rewards for those who manage to navigate the challenges of a summer spent living, breathing and dreaming drum corps. It's important to watch Throw It Down all the way through. In the first 30 minutes, uninitiated viewers might wonder why anyone would want to join a corps and work so hard. But the answer becomes clear later in the film when the intensity and repetition start to pay off. Maher and his crew have successfully created a film that is emotionally intense and visually sophisticated. At times the cinematography is so good that it's easy to forget this is a documentary and not a movie that had the luxury of a script and multiple retakes. The cameras did a great job finding the stories, capturing interesting angles and getting inside the action. "My camera assistant kept�me from being trampled when we were working close to the drill," Maher says. "We collected some 60 hours of material. Part of the trick is getting the corps members comfortable with us and then just being there at the right time. There are no shortcuts in this type of filmmaking." To develop the story line, Maher creatively weaves a series of dream sequences through the film. These segments take viewers into the lives of corps members and illustrate how immersed the performers have become in their tasks. The intensity of the dreams is balanced with doses of humor and an upbeat musical score. Some of the most clever editing is found during the audition scene when the nervous tapping of prospective members sets the pulse for a music video. Another scene that works well is the food crew's fast-paced shopping trip to buy groceries. The visual aspects of the film are complemented by an effective soundtrack. Several original songs perfectly illustrate the mood and determination of corps members. A song titled "Push Through" delivers the key line, "I won't give up, you won't give in, we'll take this thing to the end." 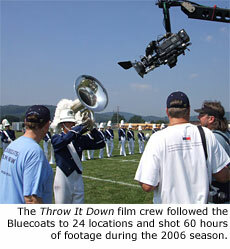 One of the strengths of Throw It Down comes from the fact that the filmmakers were largely unfamiliar with the drum and bugle corps activity. Maher has worked as a professional filmmaker for more than 30 years and Throw It Down is his 14th film. This "outsider" view allowed him to bring an independent voice to tell the story based on what he observed. Initially, the fact that Maher was not familiar with the operation and protocol of a marching unit was problematic. "The corps was concerned about our disrupting their drill routine," Maher says. "I needed to get close and they wanted me back so we danced around that sensitivity all summer. I was deathly afraid of spoiling anything for them but at the same time I had a responsibility to the producer to make a good honest film." A significant moment of bonding between the filmmakers and the corps occurred in early summer when Maher showed the Bluecoats a preview of footage that had been shot during the winter camps. "Corps director Dave Glasgow told everyone then that we were part of the Bluecoats family. That was a very emotional moment for our crew," Maher says. "We knew we needed to make a special effort to honor their concerns and make a good film." Throw It Down gets its title from the concept of performers "throwing down" the best performance they can possibly give. The film ends on a joyous note with the Bluecoats members showing ultimate satisfaction with their final performance. Yet the film is not just about a single season. Throw It Down gives viewers new appreciation for any quality performance, since they have peeked behind the scenes and witnessed the grueling effort that was required offstage. The film has already won several awards on the film festival circuit and continues to be screened at special events across the country. Visit ThrowItDownTheMovie.com for a schedule of upcoming screenings. 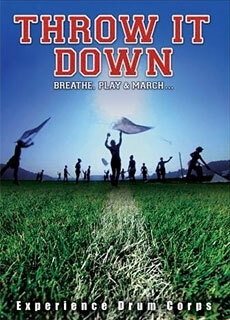 You can also order Throw It Down on DVD. Images courtesy of Throw It Down/JEM Films.